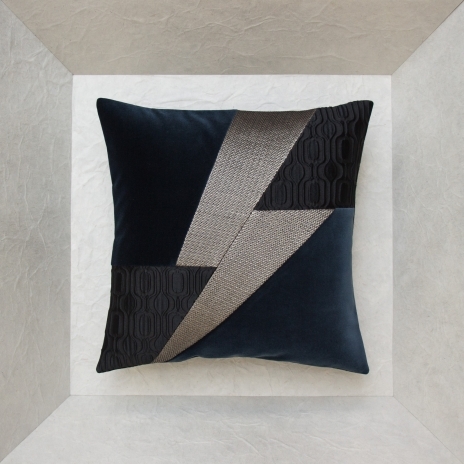 This cushion has a unique combination of materials that evokes both heavenly power and beauty. 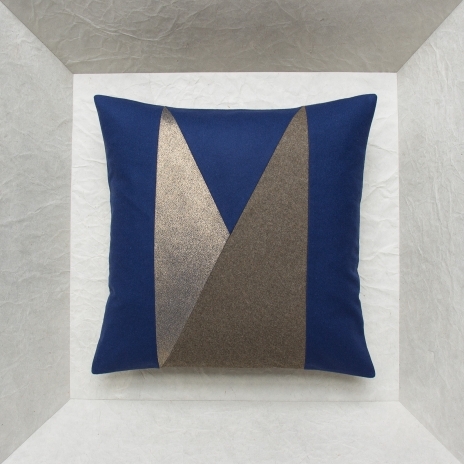 The central, geometrical pattern triangle in vintage midnight blue and gold silk adds an original, enchanting look that will shine in your living room or bedroom like no other cushion has before. Cosmic! On the front, note the raw wool fabric, the midnight blue Glen plaid, blue tennis striped raw wool twill and blue-black and gold vintage silk with geometrical patterns. The back is adorned with sepia cotton ottoman with the Maison Popineau signature: 2 blue python patterned leather tabs with golden grommets and black grosgrain ribbon.